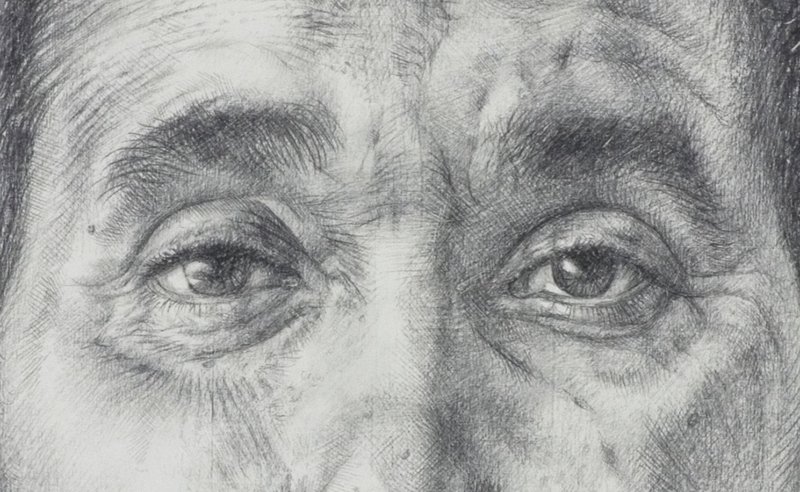 Metalpoint drawings are made by dragging sharpened wires of soft metal (usually silver or lead, but sometimes gold) over a slightly toothy, textured surface. Particles of the metal wire are deposited on the surface, leaving ghostly grey lines which will tarnish over time to a warm brown tone. While metalpoint drawings are generally made on a rigid substrate such as a panel or a piece of Bristol board which has been prepared with several layers of gesso, an innovation in the field is the Golden Silverpoint Ground, a milky acrylic ground which is designed for use on porous and flexible substrates such as hot-pressed watercolour paper. 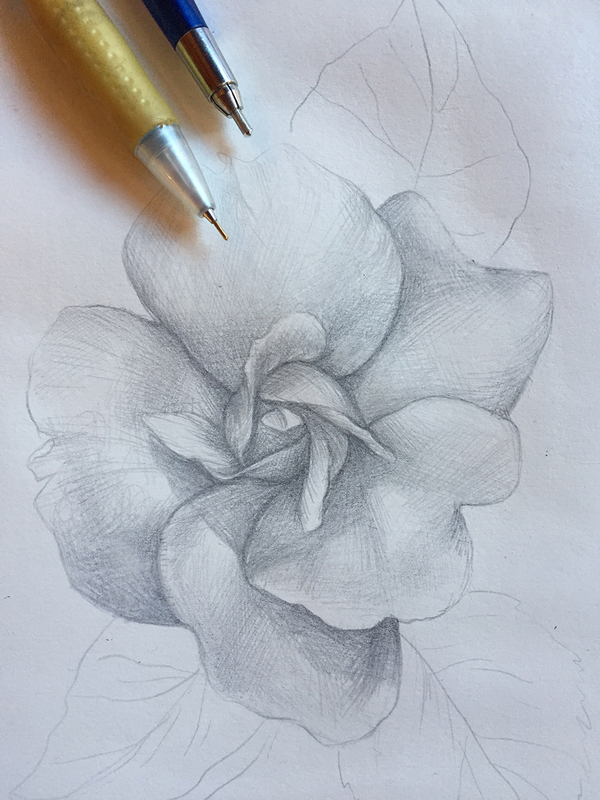 We asked the silverpoint artist Lauren Amalia Redding to test how this ready-made ground compares to traditional silverpoint supports. Detail from Lauren Amalia Redding, ‘De Donde Crece La Palma’ (Silverpoint on panel, 18 x 24″, 2015). Silverpoint is a rare and ancient drawing medium which flourished in the studios of Renaissance Europe, in which the artist draws with a piece of silver wire held in a stylus. In an age of ever-increasing automation, many artists are exploring this complex and challenging medium that was often employed by masters such as Leonardo da Vinci and Rembrandt. 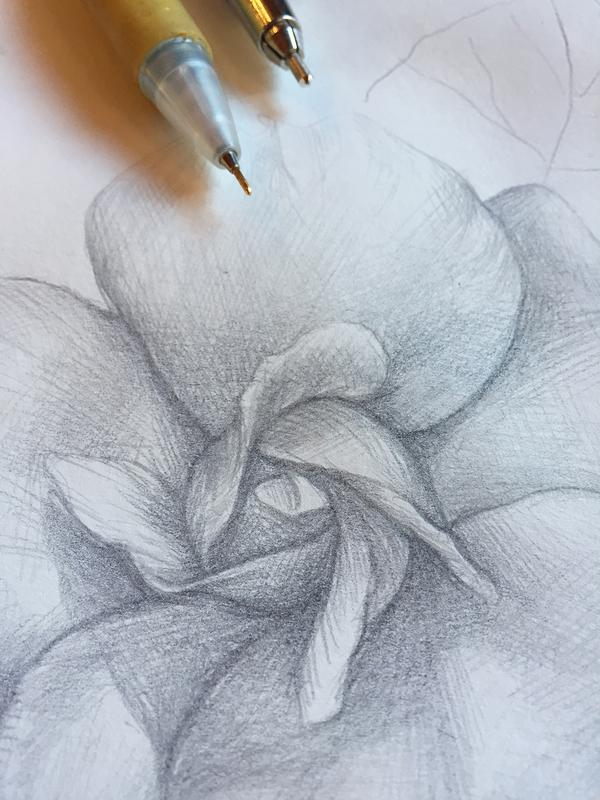 Many silverpoint artists are stubbornly intent on preparing their drawing surfaces themselves with traditional gesso or some variant — myself included. For that reason, I was very happy to review Golden Silverpoint Ground for Jackson’s. While I’ve worked almost exclusively in silverpoint on supports I make myself for a few years now, I’m woefully unacquainted with most commercial products. The Golden Silverpoint Ground doesn’t yield the same tactile experience or tonal quality of a traditional gesso, but its ease of use is wonderful. While I’ve yet to find a commercial product that competes with the texture and value range silverpoint can achieve on a traditional gesso (especially when prepared with rabbit skin glue, bone ash, and pigment), traditional gesso can prove a logistical nightmare. The rabbit skin glue must be kept at a constant temperature and many coats are often required (with much messy sanding between coats). 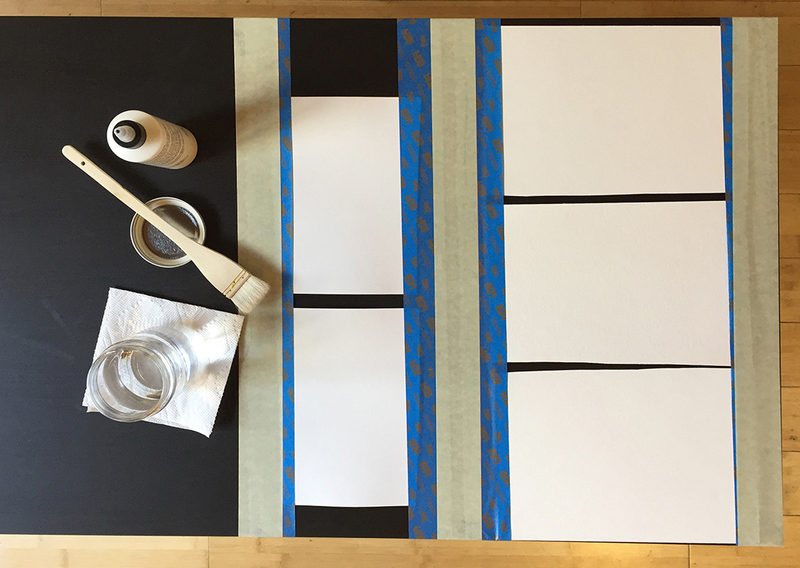 Prepping your surface can take more time than the execution of the drawing itself. Understandably, for many artists, this is impractical, overly time-consuming, and a deterrent. The Golden ground, meanwhile, makes silverpoint accessible and easy. Technically an acrylic polymer, it is easily cleaned with regular dish soap and water. Only one coat is necessary, as opposed to the many required of traditional grounds. 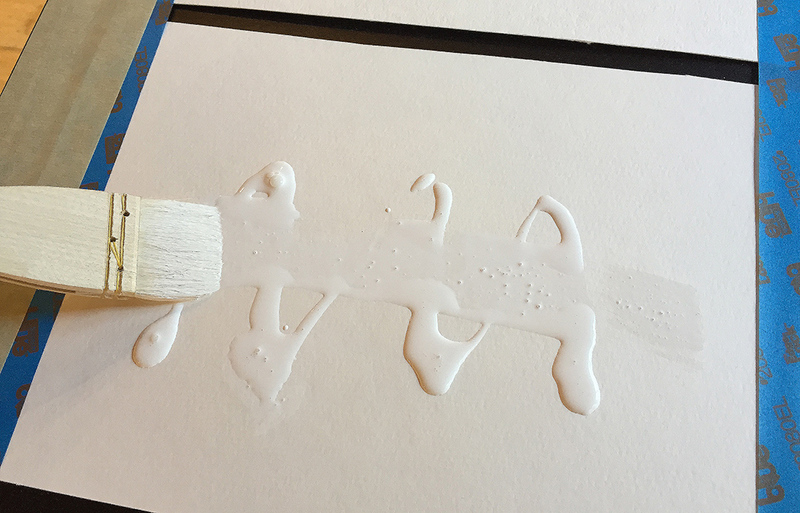 When testing a paper with two coats, I found there was no difference in performance. It is extremely milky, and is best applied with a hake-style brush that’s been lightly wetted with water. The sides of the paper should be taped down to prevent warping. (As shown in the image below). Sheets of watercolour paper taped down ready for the application of Golden Silverpoint Ground. Application of Golden Silverpoint Ground with a hake brush. I tested the Golden Silverpoint Ground on both a cold-pressed 140 lb. watercolour paper from Strathmore and a vellum 90 lb. drawing paper from the United States-based Bee Paper Company. While the heavier watercolour paper absorbed the ground more evenly and warped less, the smoothness of the vellum was superior to work on with a stylus. A hot-pressed, heavyweight watercolour paper, such as Arches Aquarelle, would be ideal. A close-up showing the tonal range possible on watercolour paper prepared with the Golden Silverpoint Ground. 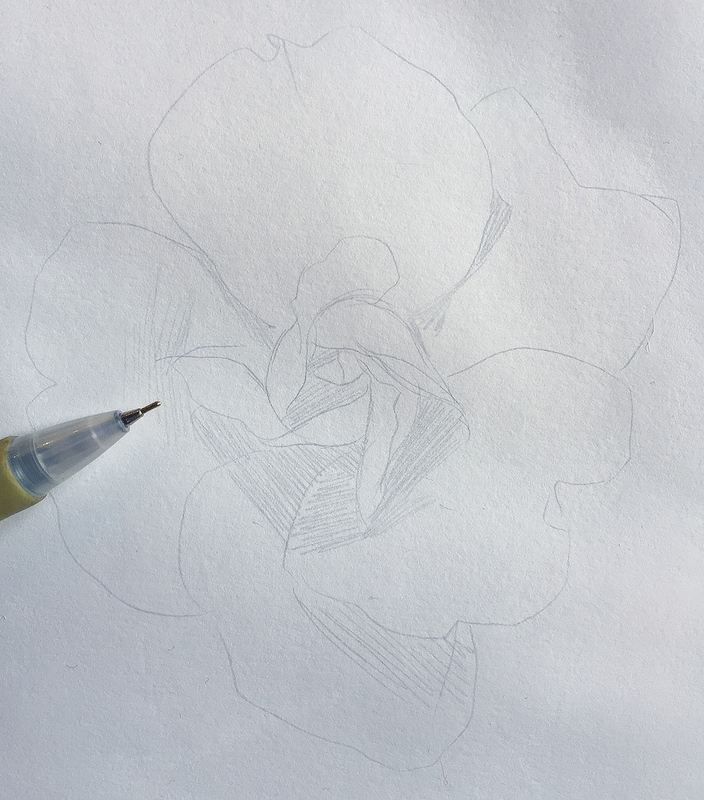 Starting to test the ground by sketching a rose; delineating the petals. Buulding up the darker values towards the centre of the flower. To be frank, this ground could go on a myriad of surfaces. As it’s so easy to use, an artist could take it with them to an art supply store and apply dabs of it on paper samples to test then and there. I was apprehensive that its surface would feel slick— and it did— but the stylus bit a little more than anticipated. One could simply add bone ash to the Golden ground to get the more typically abrasive quality of traditional gesso and a slightly increased value range. It also received goldpoint well. The Golden ground is surprisingly receptive of fine, individual lines. It is much easier to soften and lighten your mark than darken it. While deep, velvety darks may not appear, crisp lines and light, nebulous shading are easily achieved. 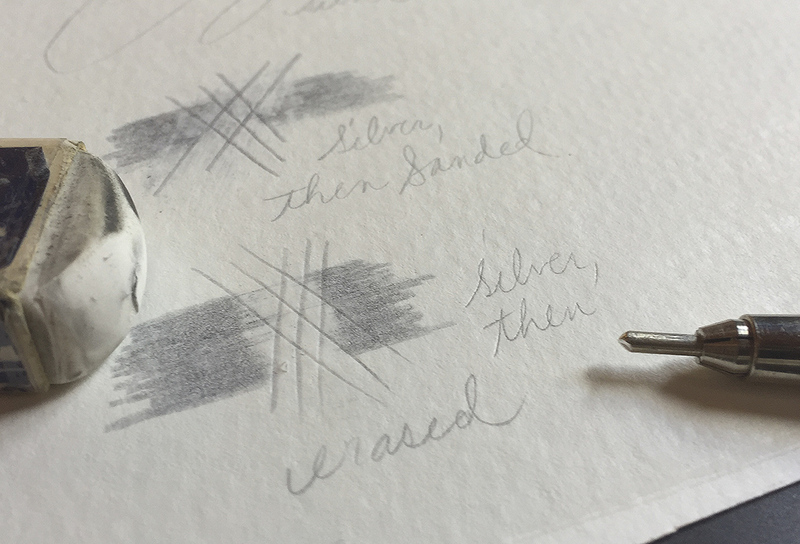 The Golden ground also allows for something usually absent in silverpoint drawing: erasure. 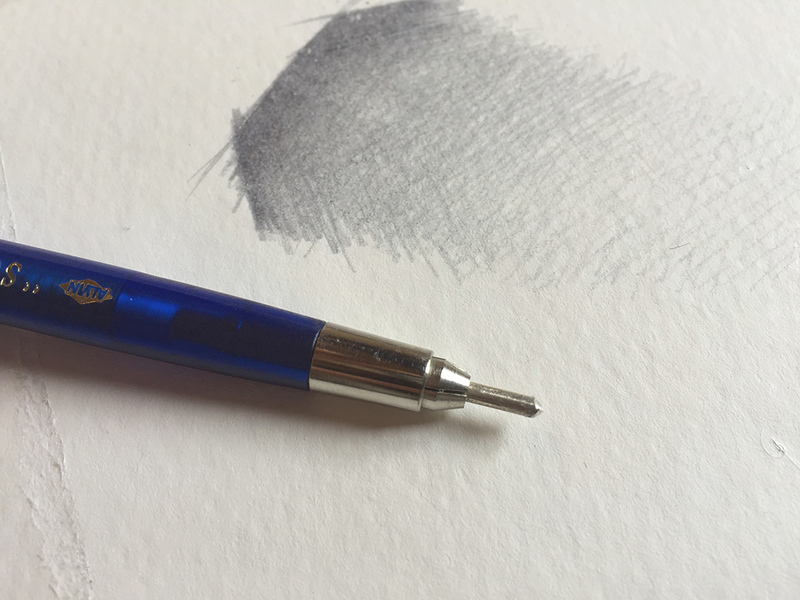 In fact, lines remove more cleanly with a rubber eraser than sanding with my usual trick of adhesive-backed fine grit sandpaper wrapped around a palette knife. Silverpoint marks can be effectively lifted with a regular eraser from paper which has been prepared with Golden Silverpoint Ground. Another pro to this ground is its flexibility. Paper upon which it’s applied easily bends and flexes with no visible damage to the drawing. This is unheard of with silverpoint, as most traditional gessoes require very rigid supports due to their brittle shell-like surface. The Golden ground’s surface seems nearly indestructible, and is water-resistant to boot. I recommend the Golden Silverpoint Ground for any artist who is just beginning in silverpoint, and wishes for a straightforward introduction to its surfaces. It is also phenomenal for any silverpoint artist who enjoys plein air sketching: I can’t imagine a better, more portable ground that would withstand sketching on-site in any sort of environment. Sketchbook pages could even be coated with it. As it’s water-soluble, it can be tinted with watercolours. 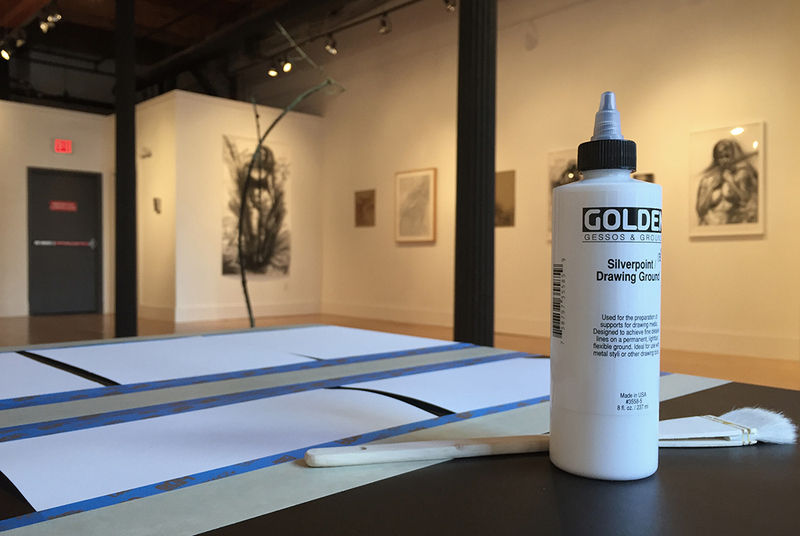 You could simply bring the Golden ground and a small hake brush with you on any art excursion and create a drawing surface. 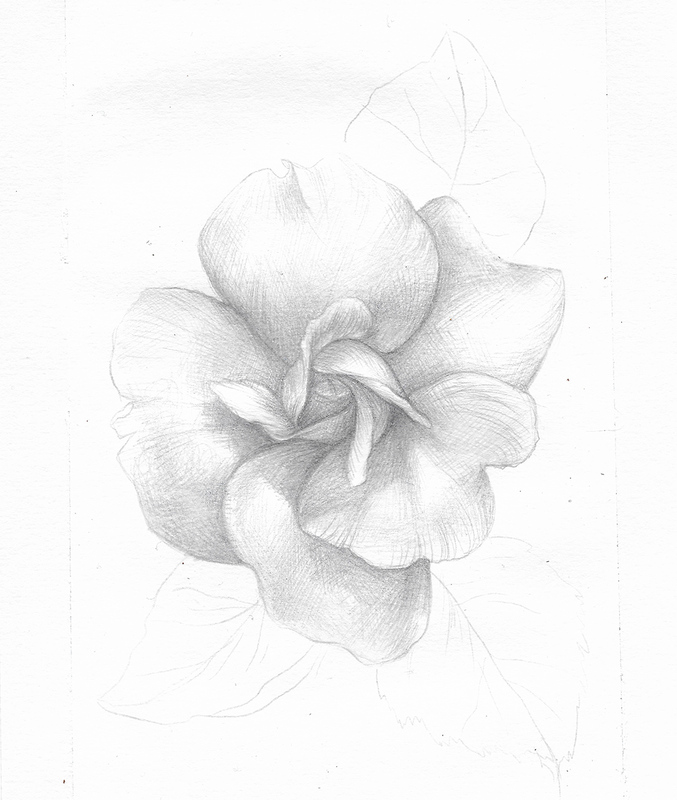 A sketch of a rose by Lauren Amalia Redding (silverpoint on watercolour paper prepared with Golden Silverpoint Ground). 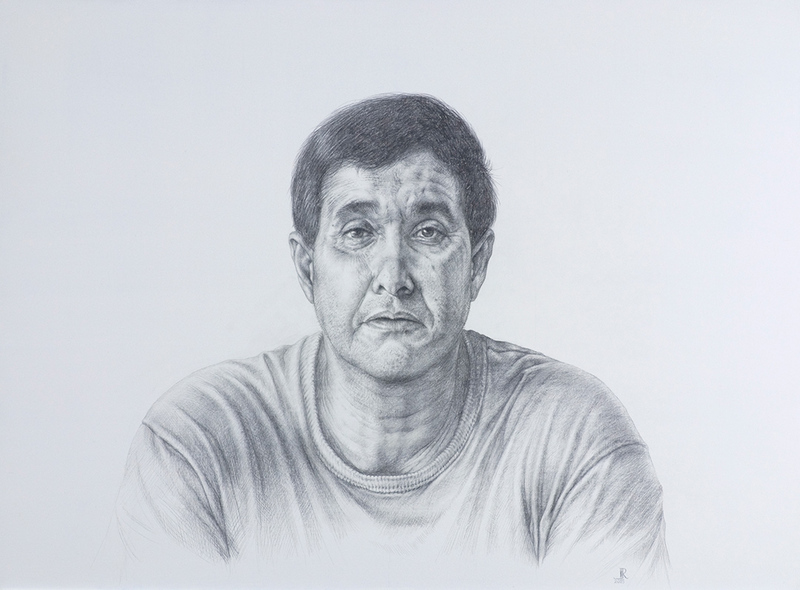 Lauren Amalia Redding, ‘De Donde Crece La Palma’ (Silverpoint on panel, 18 x 24″, 2015). Note the wider tonal range possible when using a gessoed panel as a silverpoint substrate. Again, I can’t emphasise enough the superior value range of silverpoint on a traditional ground, or its silken tactility. Building up darks akin to a graphite pencil’s value range is possible on traditional ground, but unfortunately not on the Golden ground. However, the Golden Silverpoint Ground’s uses are only limited by your imagination. An application of one single coat and a cleanup consisting of only soap and water make this a utilitarian, portable, practical product. Note: from my past experience using acrylic polymer-based grounds I’ve made myself, sometimes the silverpoint will tarnish oddly, patches of the drawing tarnishing at a more accelerated rate than others nearby, making for differences in temperature across the piece. The tarnishing also tends to be a bit expedited on the acrylic grounds. However, I won’t list this as a con, as some artists and collectors enjoy this aspect immensely. A photo of the artist sketching. 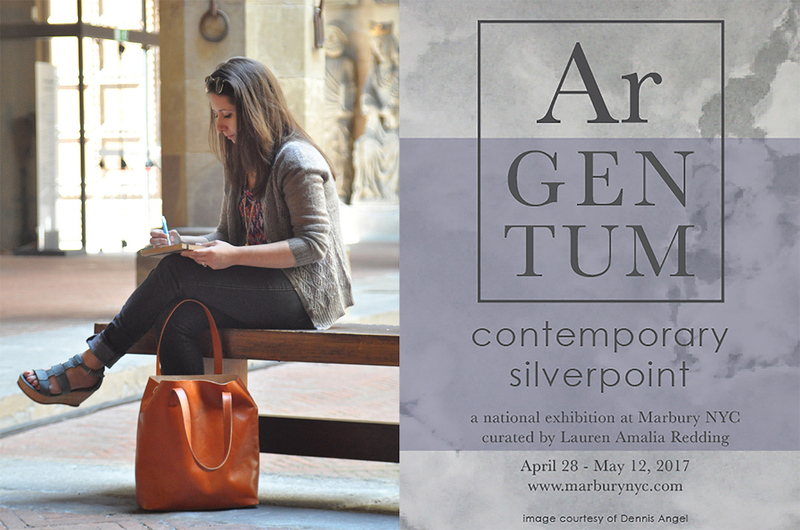 On the right of the image is the flyer for Argentum: Contemporary Silverpoint, an exhibition at Marbury NYC, curated by Lauren Amalia Redding and running from 28 April to 12 May 2017. The image at the top of this page is of the Golden Silverpoint Ground and some sheets of watercolour paper in the Lacey & Phillips Gallery, Philadelphia, Pennsylvania, where the test took place. For more information about Lauren Amalia Redding, please see her website. had to decipher and try and get my head around any article. This is the best I seen so far and thanks. Well done.